Each of the three days, students will have opportunity to explore the fundamentals of painting, using “Alla Prima” methods to faithfully render the human head. Topics will include, drawing, values, color and color temperature, edges, composition, as well as brushwork, setting up and lighting the model, and capturing a likeness. 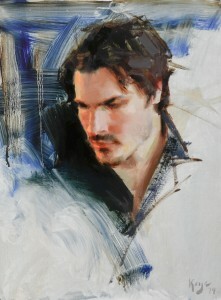 Daniel will demonstrate each morning, followed by student painting time, critiques, and one-on-one instruction. Day one will also include a digital presentation featuring an in-depth look into the foundations of sound painting, further enhancing the learning experience.